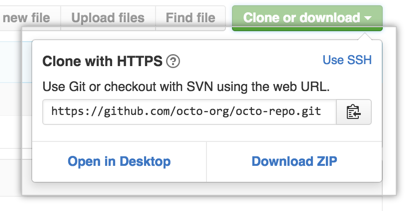 There are several ways to clone repositories available on GitHub. For information on setting or changing your remote URL, see "Changing a remote&apos;s URL." The https:// clone URLs are available on all repositories, public and private. These URLs work everywhere--even if you are behind a firewall or proxy. When you git clone, git fetch, git pull, or git push to a remote repository using HTTPS URLs on the command line, you&apos;ll be asked for your GitHub Enterprise username and password. If you have enabled two-factor authentication, you must provide a personal access token instead of entering your password for HTTPS Git. To clone a repository without authenticating to GitHub Enterprise on the command line, you can use GitHub Desktop to clone instead. SSH URLs provide access to a Git repository via SSH, a secure protocol. To use these URLs, you must generate an SSH keypair on your computer and add the public key to your GitHub Enterprise account. For information on setting up an SSH keypair, see "Generating an SSH key." When you git clone, git fetch, git pull, or git push to a remote repository using SSH URLs, you&apos;ll be prompted for a password and must provide your SSH key passphrase. Tip: SSH URLs can be used locally, or as a secure way of deploying your code to production servers. You can also use SSH agent forwarding with your deploy script to avoid managing keys on the server. You can also use a Subversion client to access any repository on GitHub. Subversion offers a vastly different feature set than Git; for a quick overview, see "What are the differences between Subversion and Git?" We have a separate article with more information on how to interact with GitHub using Subversion.